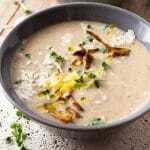 This Creamy Wild Mushroom Soup is so comforting and rich in flavour. Made with mixed mushrooms, garlic and a splash of cream, it comes together in just 30 minutes. Add the dried mushrooms to a small bowl and cover with hot water, set aside. Add the olive oil to a pot on a medium heat. Add the chopped onion to the pot and saute for 1-2 minutes. Add the fresh chopped mushrooms and cook down for 10 minutes until softened and reduced in size. Add the garlic to the pot and stir. Let the mushrooms and onions cook down for another minute or two. Add the dried mushrooms to the pot along with the soaking liquid being careful not to pour in any sediment. Add the vegetable stock and simmer the soup for 10-15 minutes. Blitz until smooth with a hand-held blender then add the cream and stir. Serve in large bowls with a drizzle olive oil and some parsley. Make sure to saute the onions and mushrooms on a for at least 10-15 minutes so they soften properly and give a delicious depth of flavour to the soup. You don't need to add cream but it does give the soup a delicious rich flavour. Add more or less cream to your liking. I like a smooth consistency but you can choose to blitz the soup to a rougher texture if you prefer. Fresh parsley goes so well with mushrooms but you could also use fresh thyme. This soup will store well in the fridge or freezer. You can use any kind of mushrooms.